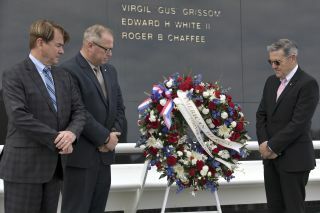 Last year's Day of Remembrance ceremony at NASA's Kennedy Space Center included the laying of a wreath at the Space Mirror Memorial. Every year, NASA honors the people it has lost with a ceremony called the Day of Remembrance — but this year's event is postponed indefinitely because the federal government remains shut down. NASA Administrator Jim Bridenstine announced the delay in a statement posted to Twitter yesterday (Jan. 23). He wrote that he was postponing the ceremony, which had been scheduled for Jan. 31, until NASA employees were working again in order to ensure that they could participate in the commemoration. "NASA's annual Day of Remembrance reminds us to reflect on not just the sacrifices that have been made by our fallen family, friends and co-workers, but also to remind us of our core values of safety, integrity and teamwork as we carry out our history-making missions," the statement reads. "Unfortunately, most of our NASA family are on furlough, and we recognize that participation in many of the Day of Remembrance activities would be a challenge." The Day of Remembrance marks the agency's three most serious tragedies, all of which occurred in late January or early February: Apollo 1, which burned during a launch simulation on Jan. 27, 1967; the Challenger space shuttle, which exploded a minute after liftoff on Jan. 28, 1986; and the Columbia space shuttle, which burned during re-entry on Feb. 1, 2003. NASA centers across the country arrange ceremonies to mark the deaths, with some events including family members of astronauts who have died while working for NASA. NASA personnel working with astronauts aboard the International Space Station and with spacecraft that are now flying are considered critical personnel and are working during the shutdown. However, many other employees have been sent home indefinitely. The federal government has been partially shut down, without a budget, since Dec. 22, with 800,000 employees not receiving paychecks.